Showcasing the finest examples of urban design and architecture in our municipality, the biennial Boroondara Urban Design Awards are a welcome opportunity to celebrate local projects that add something special to their neighbourhoods. Our regular contributor Stephen Crafti is one of Australia’s most respected and widely published architecture and design writers. This is the first of three profiles he’ll be writing about Urban Design Award-winners, which will feature in the September edition of the Boroondara Bulletin. Located in a street with a heritage overlay, there was no discussion but to preserve the home’s impressive façade and its distinctive roof form, including a small tower-like entrance. “Roofs are important to these period homes, as are their presentation to the street,” says Kennedy, who also sees the surrounding tree canopies and front fences as pivotal to the success of heritage projects. Although not obvious from the street, there’s a new white-painted brick fence that extends across the deep block. While contemporary, the style of the fence echoes those from the house's original period rather than replicating it. The brick façade, previously painted white, was carefully restored with new timber windows in keeping with what would have originally existed (steel windows were added in the 1950s). Unlike most homes of this period, which generally have one stately entrance, here there are two. One passes from the turreted entrance at the front to a sitting area, a main bedroom and ensuite used predominantly by the parents. The other one, used by the family and everyone else who visits, approaches the house from the side, with the door tucked away behind a high-painted brick fence with its unusual window alcove. 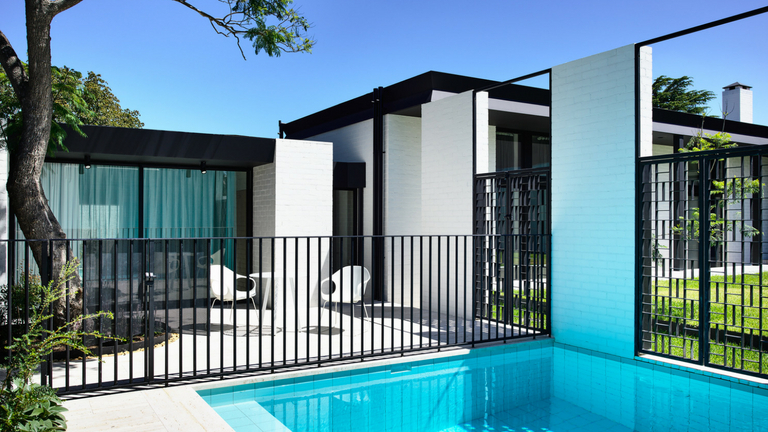 “Rachel and I wanted to make the sense of arrival a memorable one,” says Kennedy, pointing out the chevron timber front door and the John Nixon-inspired painted door behind it. One of the major drawbacks with this house was its east-west orientation, with the preferred northern orientation not being a feature of the original design. To address this problem, as well as provide additional bedrooms for the four children, Kennedy Nolan designed a courtyard-style addition. As well as a deep northern courtyard to the rear of the home, located between the old and new, there are numerous pocket-sized courtyards virtually at every turn. “Every room has a different outlook, giving each space its own character,” says Kennedy, who worked closely with garden designer Amanda Oliver on this project. “Amanda has a real understanding of plants and what will work, both visually and appropriate to each courtyard space,” he adds. The original part of the Kew house, encompassing six rooms, was thoughtfully restored, with all the rich period detailing such as the cornices and architraves painted. However, the areas within the original roofline, including a passage leading from the parents’ domain and its steel and glass door, are contemporary. Timber features extensively in the renovation, as apparent in the timber-lined passage adjacent to the children’s bedrooms. Here, the architects were inspired by the work of eminent architect Guildford Bell, in particular the Purcell house in Ivanhoe with its timber-lined enfilade. 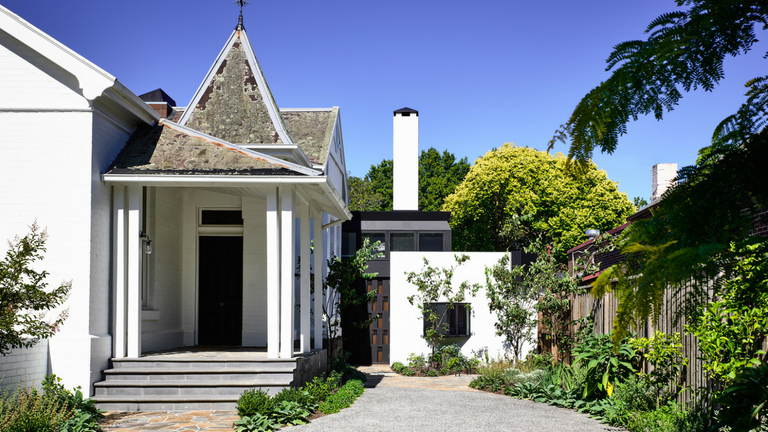 “Guildford Bell was also known for his courtyard-style house, a solution that was warranted in this renovation,” says Kennedy. Previously ‘buried’ in the floor plan, the new kitchen and dining areas now also benefit from northern light. Built-in window seats take advantage of the garden views and northern light. The kitchen, unlike the original front rooms, is unashamedly contemporary. Marble benches, streamlined joinery and undercroft steel detailing respond to a family with four children. 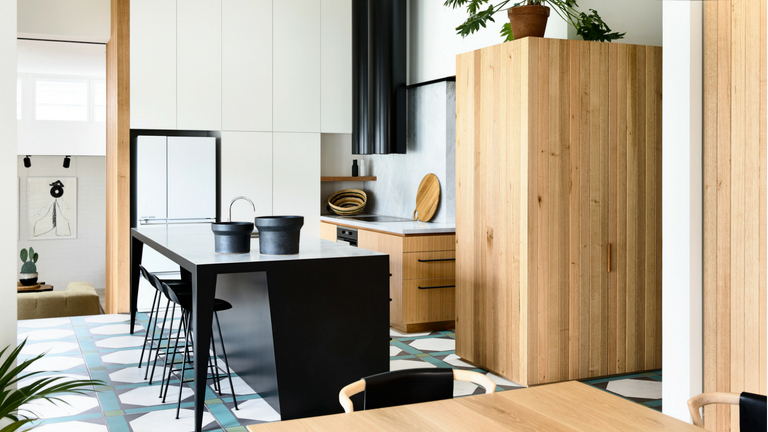 In contrast to the timber floors throughout the rest of the house, the wet areas, including the kitchen, feature bold graphic tiles. “We’ve used a combination of natural materials, as well as large-format decorative tiles,” says Kennedy, whose practice generally designs furniture and bespoke lighting for its projects. Although there’s a separate study in the renovation, along with nooks for the children to read, Kennedy Nolan was keen to ensure bedrooms weren’t simply places for the children to sleep. Each is identical in size and includes a mezzanine space that can double as a study or play area. “These bedrooms are fairly modest in size, but, as with the original home, they benefit from high ceilings,” Kennedy observes. 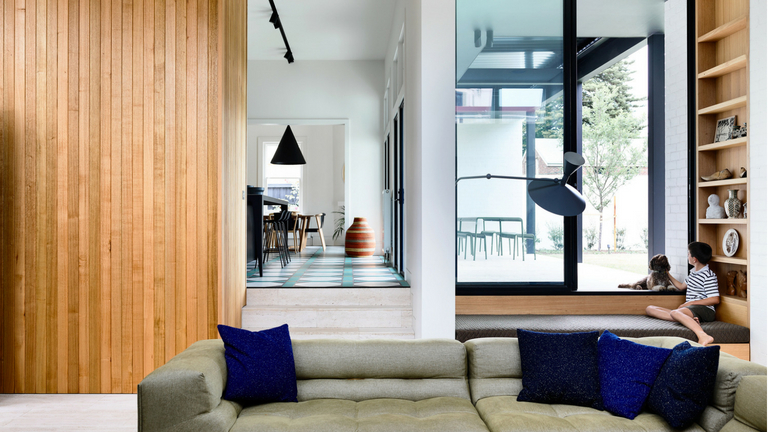 This award-winning home, which also received a commendation from the Australian Institute of Architects (Victorian Chapter) in 2017, is a fine example of how the past and present can come together to form something that’s appropriate for a family living in the 21st century.